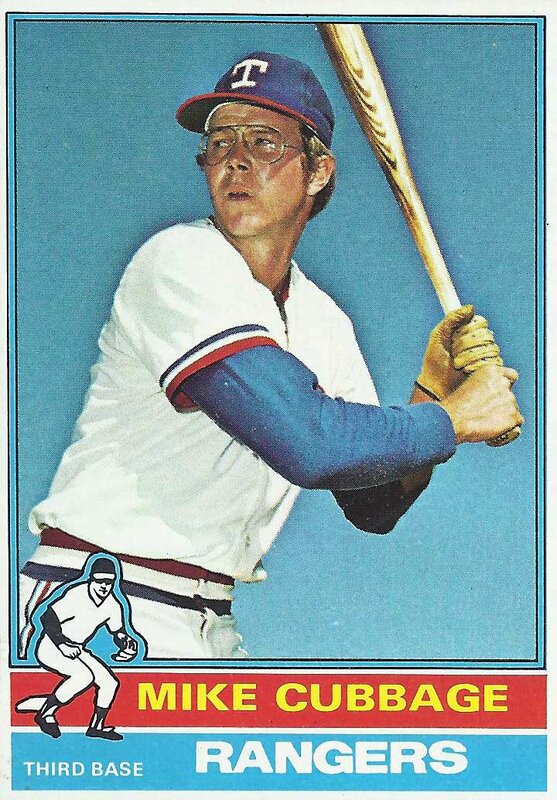 Texas Rangers Cards: 1976 Topps - Mike Cubbage. The front of card number 615 in the 1976 Topps set lists Mike Cubbage as a third baseman. The back lists him as playing third and second base. The back of the card is correct for 1976. Cubbage played in 14 games for Texas in 1976. Six of those games were at DH. Five more were at second and in one game he played at third. In 35 innings at second base Mike was perfect with no errors. His one inning stint at third base was also perfect but that was because he saw no action there. At the plate Cubbage was struggling to say the least. In 39 plate appearances he stayed just north of the Mendoza Line with a .219 batting average. The seven walks he picked up bumped his on-base percentage up to .346. He had no extra base hits and just one stolen base. In 1976 Texas was looking to make a move. The club was trying to regain their 1974 form and was willing to deal to make it happen. Mike Cubbage was a piece the franchise was willing to part with. On June 1, 1976 Mike was sent to the Minnesota Twins as part of a deal that brought Bert Blyleven and Danny Thompson to Texas. I never thought of it, but I suppose that's the disadvantage of the 1973 and 1976 Topps cards that feature that position logo. There's no room for mentioning multiple positions. Hey Spiff! That trade worked out for the Rangers I suppose. In 1984 while managing the Mets' farm team in Lynchburg, VA Cubbage was the source of humor during a Cubbage Patch Doll promo. The minor league team bought several Cabbage Patch Dolls (which were the rage at the time) and dressed them in Mets uniforms with Cubbage's name and raffled them off to three lucky winners. A rabid, over-flow crowd was the largest of the season for the Single-A team and all of the off duty police officers in Lynchburg were called in for crowd control. The Cubbage Patch Doll game was one of the highlights of the 1984 Lynchburg season.